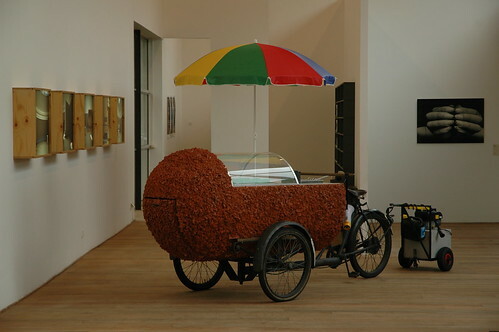 I saw this nearly perfect kroket on three wheels a couple years ago while visiting an art exhibition at Museum de Paviloens in Almere with Kyoko. 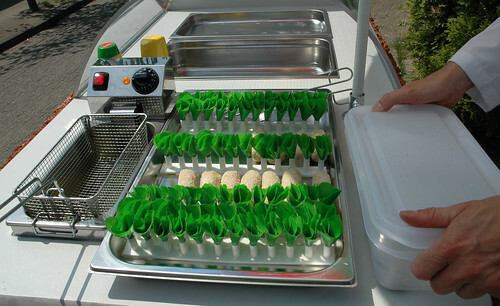 I didn’t realize then it was actually a fully functional croquette (“kroket” in Dutch) frying and vending vehicle. I just figured it was just a humorous art piece. I suppose that’s also the case judging from some of Tilmann’s other projects which include a fake Segway tour of a mental institution, a mall kiosk that made and sold concrete clogs, and a one man university. But we talked with Tilmann at another exhibition last week and he filled me in on the whole scoop. He’s German though and explains it all with a straight face so I’m still not 100% sure about the humor part. 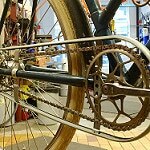 I might just be inadvertently insulting an artist here, something I’ve already demonstrated an aptitude for amongst righteous cyclists. 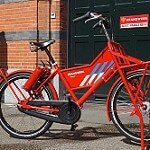 The city council of Almere engages artists to improve the social cohesion in certain town districts. 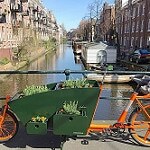 To this end Meyer-Faje developed a snack bar bike for the Stedenwijk Noord neighborhood which has no shops or restaurants. It’s a “bedroom community” which is fairly unusual in the Netherlands. The concept was to introduce mixed development to this monofunctional, planned neighborhood. 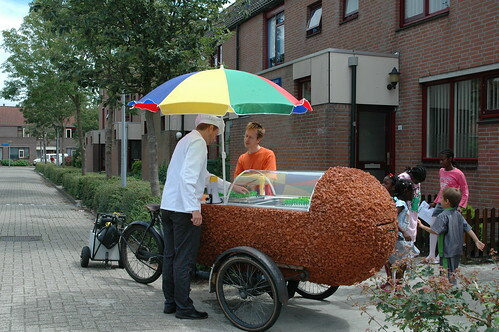 From his special bakfiets Tilmann deep-fried and served croquettes made from recipes of the local residents. Croquets are currently regarded as cheap fast food but originally they were “grandmas homemade pride” of the traditional Dutch kitchen. Every oma has (or had) her special kroket recipe. Here’s an overview of Buurtkroket. And here’s the buurtkroket site where you can find croquette recipes, links, discussion etc. 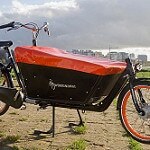 The kroketbakfiets has spiritual roots in the street vendors’ bakfietsen of the olden days. 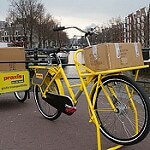 Until about the 1960’s all kinds of goods were commonly transported and sold from special bakfietsen on the streets of Dutch cities. 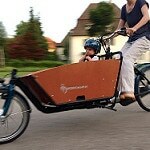 The milkman had a bakfiets outfitted to carry several steel milk jugs. 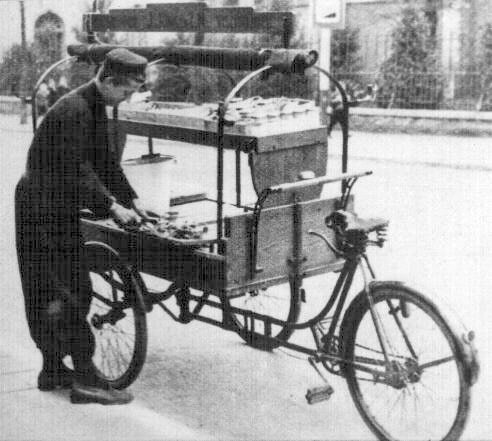 The bread baker rode an enclosed bakfiets with various drawers and compartments while the cake and pastry baker had a fancier box with glass display windows. 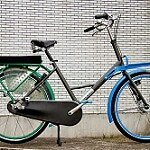 The fishmonger had his trike equipped with bins and a work surface for cleaning and cutting the fish. 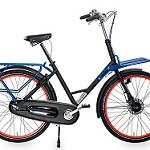 Many of these were standard models that could simply be purchased from various firms such as Huisman, Lely and Maxwell. 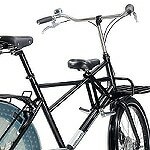 Even the major bike manufacturers offered bakfietsen though they were sometimes built by other firms such as the Gazelles which were (at least in the 1960’s-70’s) apparently built by Apollo in Aalten. 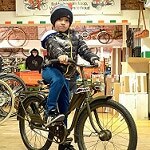 Only one classic bakfiets is still in production… the Huisman that WorkCycles sells. It’s been built continuously since the 1930’s. 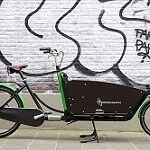 Have some ideas for the future of the krokettenbakfiets? Tilmann hinted that it might be for sale, at least for the right buyer and price. You can contact him via his sites above. 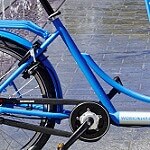 This entry was posted on Tuesday, April 6th, 2010 at 08:00	and is filed under Antique/old bikes and history, Bicycles and Art / Fiets and Kunst, Cargo trikes / Bakfietsen, Cool & Interesting bikes, Funny stuff. You can follow any responses to this entry through the RSS 2.0 feed.You can skip to the end and leave a response. Pinging is currently not allowed. Yes hip hip horea voor de Kroket. Definitely one of the Dutchies best kept secrets. Crunchy on the outside and gooey and tongue singing inside. I don’t know about social cohesion….there certainly is some fat cohesion going on. 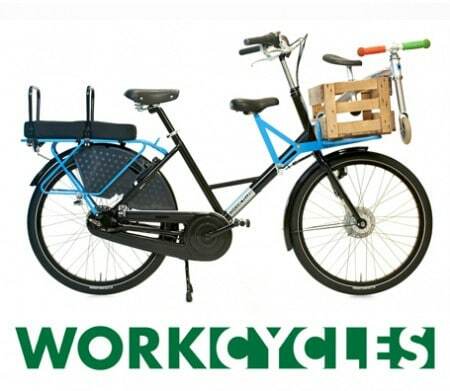 Good job you can now combine Kroket with biking! Funny post Henry! 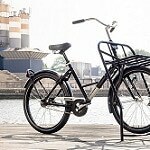 Unrelated to bikes, but how did you find your apartment in Amsterdam? I’ve read a lot of sites that say ex-pats can get charged double or triple what a Dutch person can, and then I’ve seen some for rent websites (all in Dutch, not for expats) that do have great looking apartments for a lot cheaper than “ex-pat friendly” sites. My wife and I are moving in October for my work (so I’ll have a work visa) and I’m trying to find the best route. Thanks. Reasonably priced rental apartments are indeed tough to find here but it’s really quite a complicated topic; There are subsidized apartments (with 15 year waiting lists), open market apartments and plenty of scams to beware of. But there is no intrinsic. legal advantage for locals over foreigners. Thanks Henry. Been reading your blog for a while now (since the idea of moving there first started looking possible). Do you have a favorite site to check or do you find it easiest to search once there? I was thinking of finding something short term and then doing the work for a long term one there but I don’t know how easy that’ll be. Finding something decent takes time and lots of visits so don’t expect that you’ll be able to arrange more than a temp apartment from a distance. Thanks! 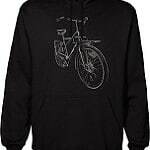 We’ll probably stop by the store as we shop for bikes once we arrive.